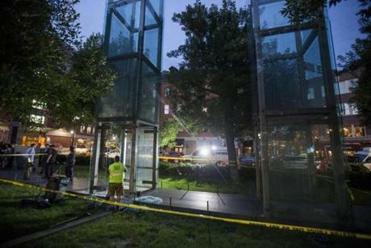 The 17-year-old Malden resident who allegedly hurled a rock through a glass pane of the New England Holocaust Memorial in Boston faced a judge Tuesday and was ordered to undergo mental health treatment. The teen, whose name was withheld because of his age, appeared for arraignment in Boston Juvenile Court on charges of disorderly conduct, malicious destruction of property over $250, and causing injury over $5,000 to a church, synagogue, or memorial, according to Suffolk District Attorney Daniel F. Conley’s office. Judge Terry Craven released the youth on personal recognizance and ordered him to stay away from the memorial and “comply with mental health treatment,” Conley’s office said in a statement. Brian Wiseman, a lawyer for the juvenile, could not immediately be reached for comment. Prosecutors did not provide details of the teen’s motivation for the alleged vandalism. The vigil comes after the Holocaust Memorial in Boston was damaged for a second time this summer and amid the deadly violence in Charlottesville, Va., last weekend. 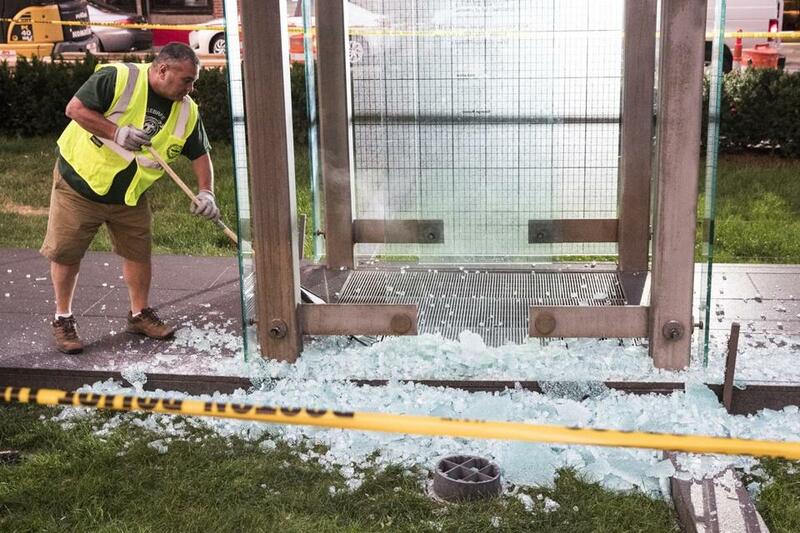 The vandalism Monday, which followed a similar attack on the memorial in June, came two days after a white nationalist rally in Charlottesville, Va., turned deadly. Mike Ross, a former Boston city councilor whose father, Holocaust survivor Stephan Ross, helped found the Boston memorial, on Tuesday drew a direct link between Trump’s rhetoric and the vandalism that shocked the city on Monday. Trump, who tweeted soon after the Virginia rally that Americans must “condemn all that hate stands for,” had not weighed in publicly on the Boston incident as of Tuesday evening. His words were echoed by Malden Mayor Gary Christenson, who said he was “completely disheartened” in the aftermath of Monday’s vandalism. But he also sounded a hopeful note, telling reporters and onlookers that the community would “fight back” against all forms of hatred. Additional speakers included Israel Arbeiter, an Auschwitz survivor who is also a cofounder of the memorial. While details about the Malden suspect were scarce on Tuesday, the public learned more about the two bystanders who chased him down the night before and held him until police arrived. “They gave chase, they caught up with him, and held him until the police arrived,” said Steve MacDonald, a Boston Fire Department spokesman. He said the firefighter, a 10-year veteran of the department, provided him with an account of the pursuit but declined to be interviewed and didn’t want his name published. The suspect said only “OK, OK” when the bystanders caught up with him, MacDonald said. The firefighter, MacDonald said, was well aware of the significance of the memorial and the fact that another vandal had previously damaged the structure in June. “He just said, ‘It was the right thing to do.’ We weren’t just going to sit there and watch something like that happen,” MacDonald said. Meanwhile, tensions briefly ratcheted up again at the memorial Tuesday morning, when a different suspect kicked over flowers that someone had left at the scene of Monday’s crime, according to authorities. That man, 37-year-old Said Bouzit, who said he lived at a mental health facility in Boston, was arraigned in Boston Municipal Court on charges of vandalizing a grave planting and disorderly conduct, Conley’s office said. Bouzit was held on $5,000 bail, and his open bail was revoked on a case charging assault and battery on a corrections officer, according to prosecutors. Earlier Tuesday, police and TV cameras were visible as tourists stopped to look at the memorial and morning commuters walked to their offices. Several bouquets of flowers were visible where the panel had shattered. The memorial features six chimney-like glass towers, built with 132 panes of glass etched with numbers, an allegory for the numbers tattooed onto the arms of Jews murdered in Nazi death camps. Janet V. Stein-Calm of the American Association of Jewish Holocaust Survivors of Greater Boston also spoke at the afternoon briefing and extended an invitation to high school students in Malden and across the state to visit the memorial to talk with survivors of the genocide.